Road to Undisputed may be the title for Saturday night's big heavyweight boxing clash between Anthony Joshua and Joseph Parker, but the Bundesliga boasts an even bigger bout just hours before when Bayern Munich weigh in against Borussia Dortmund in Der Klassiker. Bayern will be proclaimed undisputed heavyweight champions of the Bundesliga once more should second-placed Schalke fail to register a point at home to Freiburg on the undercard and Jupp Heynckes's team overcome the menacing visitors in Black and Yellow. Indeed, if the stars align in Gelsenkirchen for the men in red and they then deliver a knockout blow to Peter Stöger's side, it would represent the first time the record champions have won a top-flight title at home since 2000. Watch: Der Klassiker always delivers! Beware a Dortmund team dancing under the instructions of their heavy-hitting tactician, however, with south-paw Stöger determined to spring a surprise big enough that would maintain his unbeaten start to life at the BVB helm, a run that has taken in seven wins and five draws to date. In striker Michy Batshuayi, Die Schwarzgelben have a contender who is showing all the signs of becoming a future champion in Germany, the Belgian brawler already Borussia's top goalscorer in 2018, weighing in with an impressive six Bundesliga goals since his loan switch from Chelsea. Yet in terms of who packs a more potent Der Klassiker punch up front, there is only one name to consider: Polish lord of the metaphorical ring, Robert Lewandowski. The 29-year-old marksman currently has 23 Bundesliga goals and is on course to win the Torjägerkanone - or top-scorers' trophy - for a third time. He has famously won one each for Dortmund and Bayern in the past. Indeed, Lewy hasn't taken much pity on his former employers since switching allegiances, scoring seven times against Die Schwarzgelben since 2014. With one added Klassiker goal in BVB’s colours, the Warsaw native is currently this fixture's active top-scorer with eight goals after 15 games. History points to legend Gerd Müller as the Der Klassiker's all-time leading marksman, Der Bomber thumping in an unmatched 14 goals against BVB back in the day while the recently retired Philipp Lahm is still winning on points at the top of the Klassiker appearance stats. Munich's own FIFA World Cup winner featured 20 times against Dortmund, with opposing goalkeeper Roman Weidenfeller currently on 18. Next up is chameleon Mats Hummels, who swapped Bayern for Dortmund, only to change back again in 2016. The 29-year-old has racked up 17 Klassiker appearances. Any assist slugfest would clearly be dominated by fleet-footed Franck Ribery, the French flank warrior feeding his gleeful teammates with eight passes for goals against BVB down through the years. Nuri Sahin, meanwhile, has clocked up four killer passes, making him Dortmund's assist king in the fixture since the turn of the century. Watch: How Bayern overcame their rivals in the corresponding fixture. 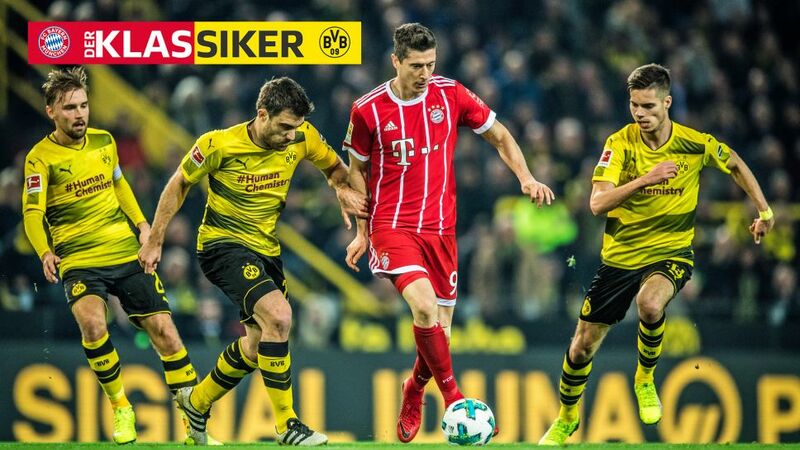 On the Road to Undisputed, Bayern will be looking to provide the decisive blow by taking out their long-standing rivals to claim the title, but expect Dortmund to come out fighting as they look to deliver a sucker punch that could keep things interesting at the top for at least one more week.